Sampford Brett (ST 090402) has a lovely light ring of six (Tenor 7-2-10), rung from the ground floor. 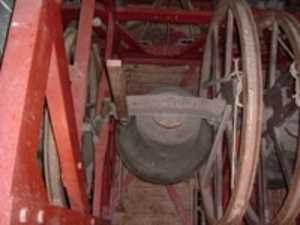 The bells were re-hung on a metal frame and augmented to six in 1968 by Whitechapel bellfounders. Service ringing takes place for Sunday morning services - usually for 30 minutes before the service begins. Please check for details. We practice on Thursday evenings from 7.30 to 9.00pm with ringing ranging from call changes to treble bob methods (subject to availability of appropriate ringers). Visitors are always welcome. The bells are available for Quarter peals arranged through the Tower Captain, Martin Blazey (01984 632683). The P.C.C. does not permit full peal ringing. If you'd like to learn to ring, please contact Martin Blazey or Jan Swan (633787). Recently a simulator has been installed which means the bells can be silenced and practice sessions can take place using computer generated sound only audible in the ringing chamber itself. Sampford Brett is affiliated to the Bath and Wells Diocesan Association of Change Ringers (Dunster Branch).